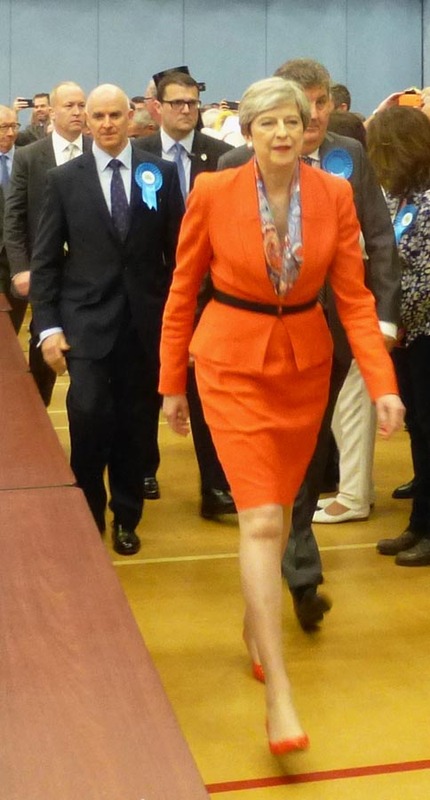 Myself and 12 others stood along side each other to contest this seat, and one other, was none other, than Theresa May our current Prime Minister. I had spent a couple of days campaigning in the area whilst getting my nomination papers signed, thanks to Emma Theron ‘The Barmy Baroness of Berkshire’ and all her friends in Wargrave, a great help they were too. Its good to have party members on hand when you need them. Being on the Daily Politics show with Andrew Neale gave us some good exposure, letting people know that we were taking part in this election. Moved into Maidenhead on Sun 4th June to take up residence in the Thames Riviera Hotel until it was all over. 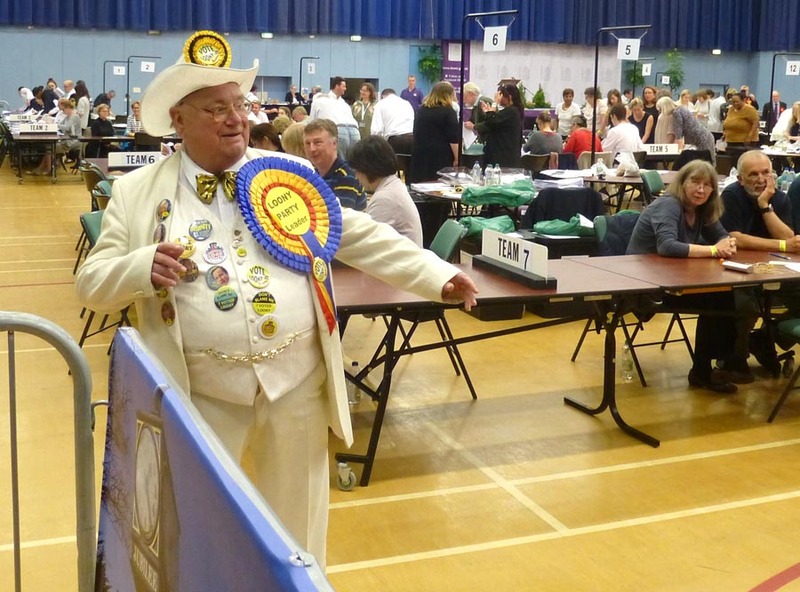 Maidenhead wasn’t the kind of town I thought it would be, at least not canvassing wise, a high profile Parliamentary Election like this, and only I and the Green Party were seen on the streets according to the locals. Wednesday I had more support arrive, Lawd Lawson, and O B Joyful arrived, staying in same hotel. We very quickly decorated their big 4×4, and took to the streets much to the glee of people around town, with the Loud Hailer. To rounds of applause and shouts of “well done” we are voting for you. Well, 119 kept their word. Wandering around meeting all the usual faces and media guys and gals, good banter, good fun. 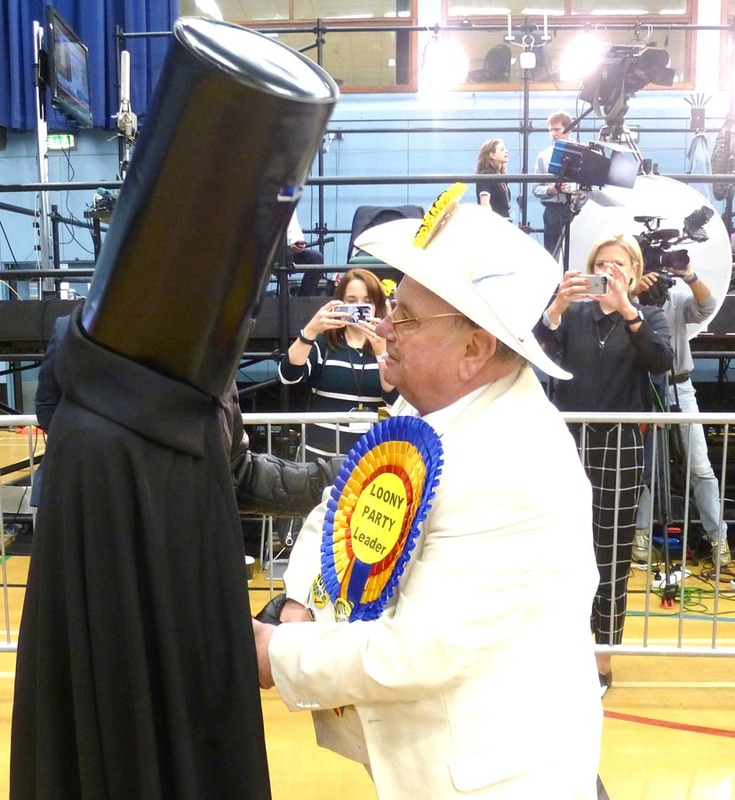 And of course ‘Lord Buckethead, and I had a lot to say to each other. I suspect that he not the original L B, when I asked him if he was the same L B who stood against Margaret Thatcher and John Major, all I got was “I am Lord Buckethead”, when my question needed a yes or no, but then again a typical politician I suppose, but I doubt that he is ! He caused quite a stir, but we handled each other pretty well. 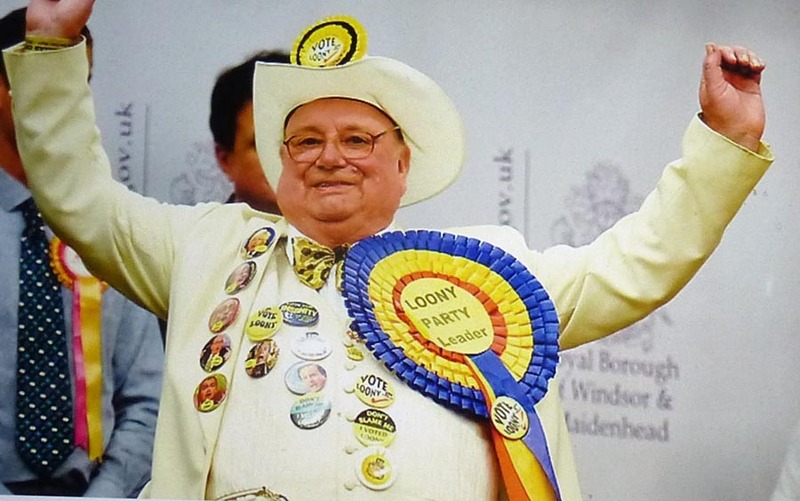 When we rule the ‘Looniverse’ he is the minister of Intergalactical Affairs. The big moment arrives, in comes the ‘Lady in Red’ would you believe, yes Red, not Blue. Another big mistake she made, apart from calling a General Election and walking away with less seats than she had to start with. On watching this Mr Corbyn must have been laughing all the way to his bed time. She was rushed, no time for cameras or any other media. Reporters were shouting “Prime Minister, Prime Minister, are you going to resign”, which didn’t add too her esteem at all. Candidates were called to the stage for the final countdown, this is when I can assure you that I was the only other candidate that she spoke to. I gave her one of our badges with her face on, with a balloon saying ‘Vote Loony’, she declined at first but I insisted, “take it, its for you” when she saw that it was only a badge she took it, smiled, showed her ‘minder’ and handed it back to me. Once again “no its yours” upon which she remarked, but I have no pockets ! ! ! Upon which I remarked “ok I’ll post it to you “. Her final words with a wry smile were “ok if you must”. After her speech she was whisked even quicker through the back door, once again leaving the Cameras, TVs, reporters all stranded.I did notice a tear in her eye, a very disconcerted woman. Getting back to the results of the evening, as I said earlier, I got 119 votes, and thinking of the Daily Politics show when Andrew Neale said if “I got to many votes it would put my party leadership in jeopardy” I thought I’m ok here after watching some of our other amazing results come in, what a great accolade for our leader to come last. But it was not to be, Nigel Knapp who stood against Jeremy Corbyn in Islington North, beat me to the post with 106, 13 votes less than me. Well done Nigel, and well done to you all, what a great effort at such short notice. The Belle of the Ball title goes to Ann Kelly, the Mid Bed Minx she polled 667, the bottle of Champagne is hers, and in all fairness a pint of beer for Nigel, to be claimed at this years conference in Blackpool ! — 3,890 votes in all, once again, you all be proud of yourselves, as we are all proud of each other ! ! If you as a candidate have any stories to tell about your experiences with photo’s, send them in, its all very good for the history and the archives of our Illustrious Party. This coming Friday 16th June, please spare a thought for our dearly departed Spiritual Leader, ‘Screaming Lord Sutch’. It will be 18 years ago that he left us. I know its an annual ritual for some to visit him in Pinner Cemetary, if you go along I’m sure you will meet other like minded people.